All dinners come with choice of one side: Baked Potato, Rice Pilaf, sautéed vegetable, sliced tomatoes or asparagus. We pride ourselves in providing corn fed Midwestern beef aged a minimum of 28 days. For any steak with sautéed onions, add $3.75, sautéed mushrooms, add $5.50 and with both sautéed onions and sautéed mushrooms, add $6.50. Add a house salad, $8.00. Ask for our featured steaks off the menu tonight. A nice 12 oz. cut cooked to perfection Prepared to your liking. Marinated in olive oil, rosemary, thyme and garlic. All the trimmings and fries. Fresh vegetable medley, rice pilaf or baked potato and an artichoke. Dipped in egg wash, breaded and sautéed in butter. The poor man's abalone. Jumbo shrimp sautéed in lemon butter and wine with diced tomato, served on garlic toast. Seared medium rare. Have it blackened and sliced for $1.00 extra. Fresh and Broiled to perfection. 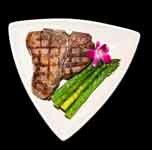 A generous culotte top sirloin with Lobster tail Upgrade to Rib Eye, New York or Filet, Priced accordingly. A generous culotte top sirloin with Grilled Swordfish. Upgrade to Rib eye, New York or Filet, Priced accordingly. All selections are dipped in our famous batter and fried to perfection. Fish, Scallops and Jumbo Shrimp. 12 and under ONLY Please. All meals come with French Fries (except Pasta) and chocolate Sundae.